4Videosoft Video Converter Platinum can convert between any video formats including MPG, MPEG, MPEG2, MP4, SWF, FLV, VOB, MOD, M4V, AVI, etc, along with HD videos, like HD TS, HD MPG, HD MPEG, HD MP4, HD AVI, etc and extract audio from these videos. It can convert between all audio formats including MP3, AAC, AC3, WAV, WMA, M4A, RM, ect with excellent conversion speed and quality. Now 6X faster conversion speed with NVIDIA??? CUDA??? and AMD APP. Convert between all the popular video/audio formats; extract audio from video. Apart from the main converting functions, 4Videosoft Video Converter Platinum possesses strong editing functions: Effect, Trim, Crop, Join, Watermark, Take Snapshot. Therefore, to some extent, it is a professional video editor. Accompanied with the friendly and easily user-interface, it also can bring you brand-new visual perception. Moreover, now 6X faster conversion speed with NVIDIA??? CUDA??? and AMD APP. This platinum video converter can convert video to only the audio for your listening. It can be used to convert video for iPad 2, iPhone 4, iPhone 4S, iRiver, PSP and other portable devices. 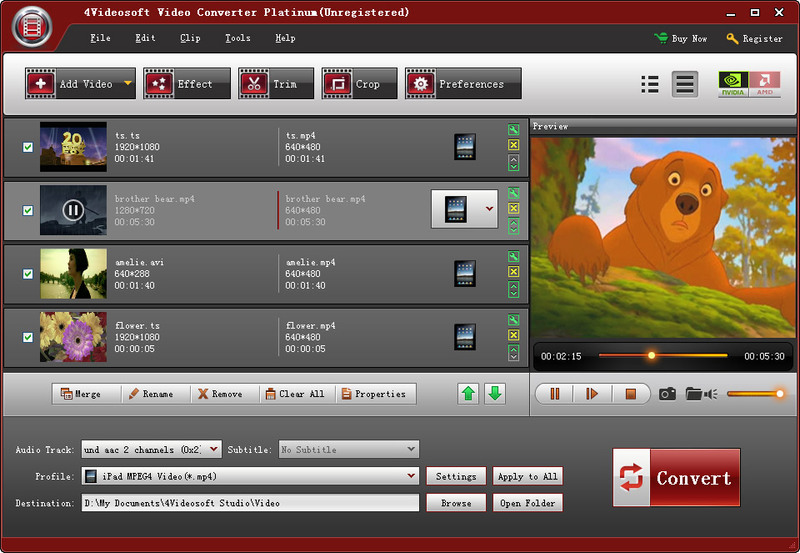 4Videosoft Video Converter Platinum can merge your selected video sources into one file for you to enjoy conveniently. Qweas is providing links to 4Videosoft Video Converter Platinum 5.0.26 as a courtesy, and makes no representations regarding 4Videosoft Video Converter Platinum or any other applications or any information related thereto. Any questions, complaints or claims regarding this application 4Videosoft Video Converter Platinum 5.0.26 must be directed to the appropriate software vendor. You may click the publisher link of 4Videosoft Video Converter Platinum on the top of this page to get more details about the vendor.